Helps to remove calluses from the feet. 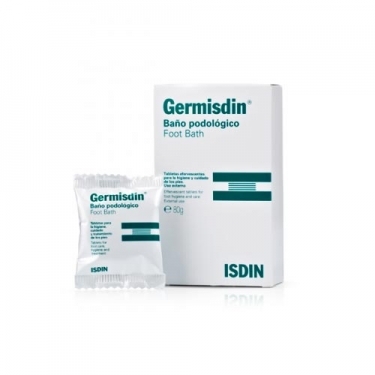 DESCRIPTION: Germisdin Foot Bath from Isdin are effervescent tablets that are indicated for the hygiene, care and treatment of tired feet, with tendency to excessive perspiration. Also effective in removing calluses. For hygiene and foot treatment with excessive perspiration. Effervescent base with relaxing properties, activating the circulation, with deodorant antiseptic agents and with urea for a hydration from the deeper layers of the skin. Dissolve one tablet in 3 to 5 liters of hot water and soak the feet for 10 to 20 minutes. For greater effectiveness, repeat the podiatric care twice a week.